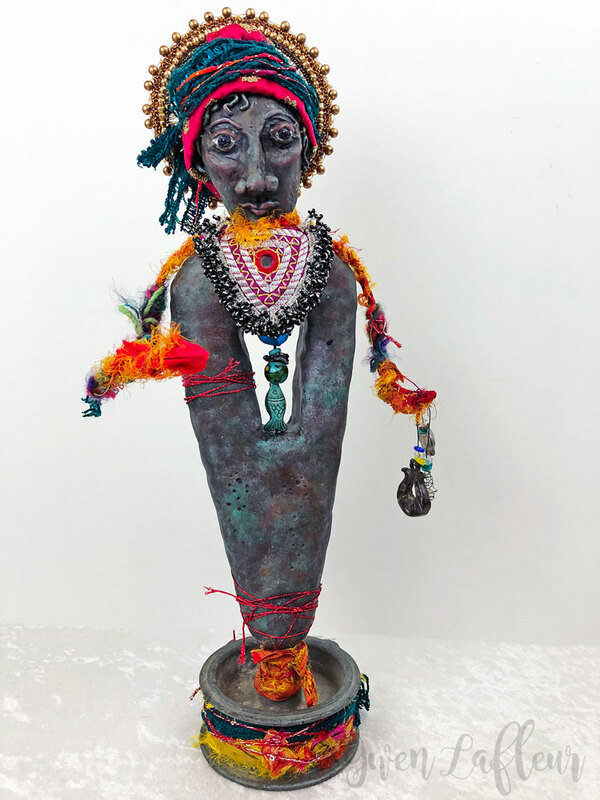 "Dream Goddess" entirely handmade, this spirit totem mixed media sculpture. 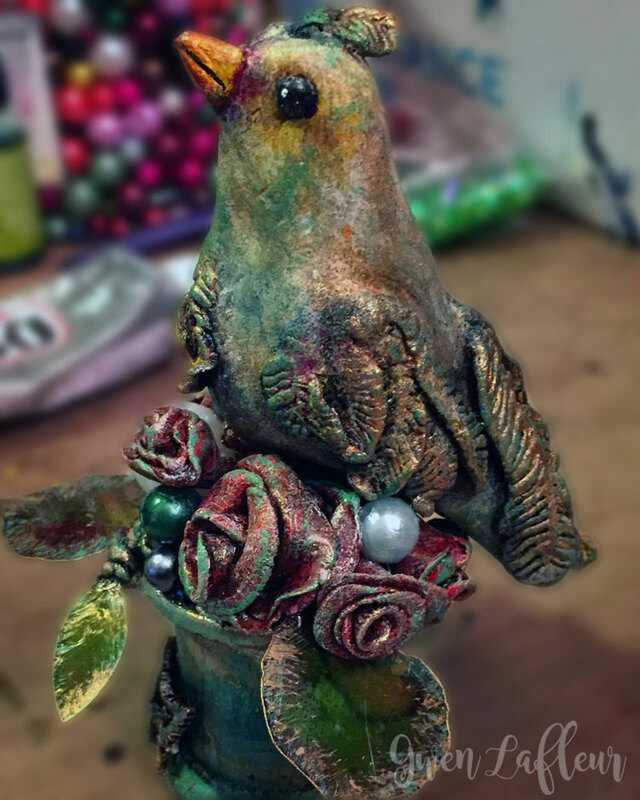 She stands about 14" tall on a metal base and is made from clay with a foam armature. 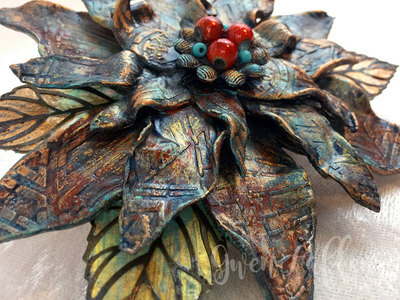 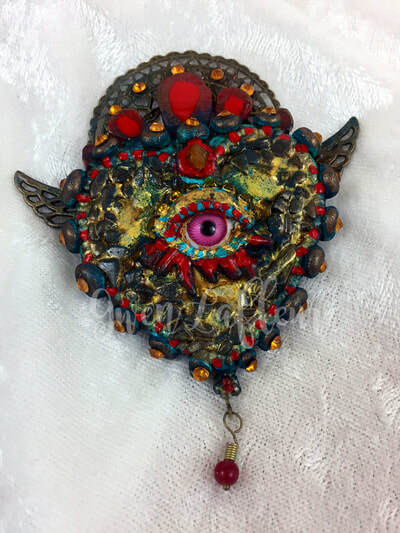 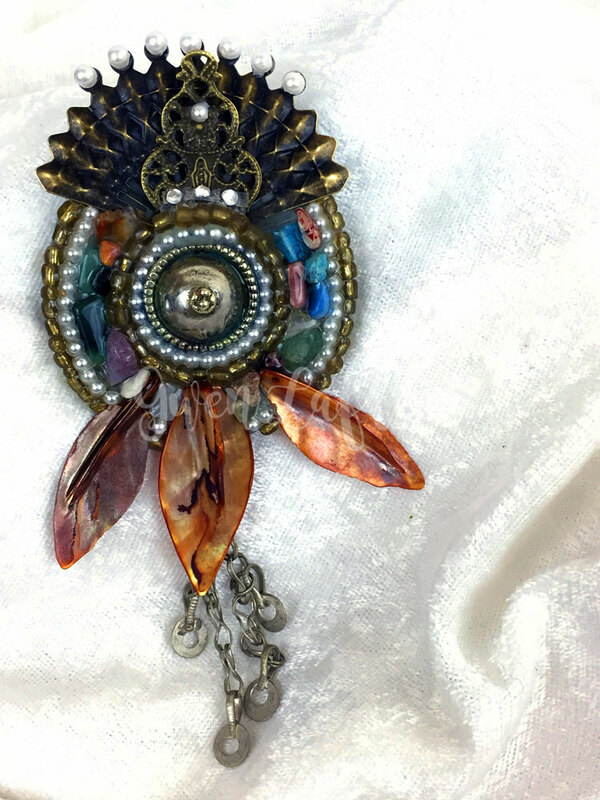 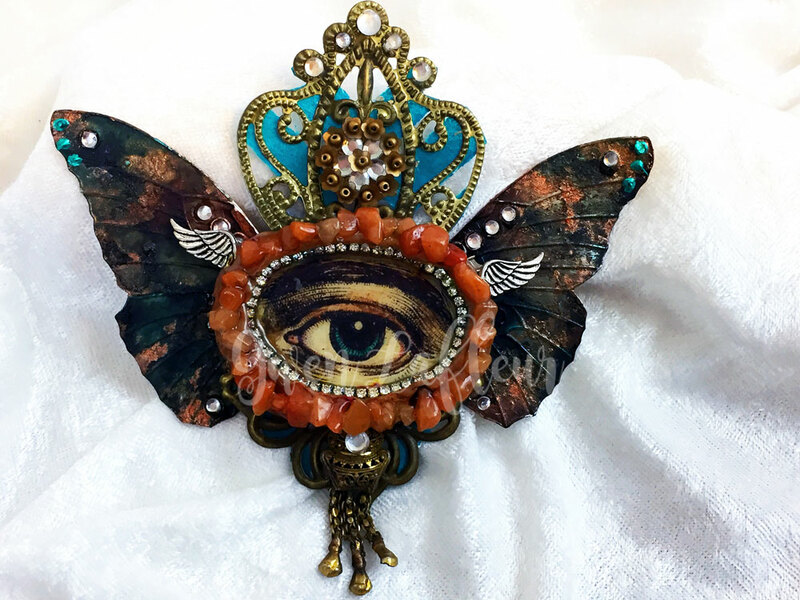 She's embellished with silk sari ribbon, a beaded Kuchi patch, Czech glass beads, a beaded and mirrored applique, a metal talisman from Thailand, and more. $644.95 - email if interested. "La Plume" mixed media artwork. 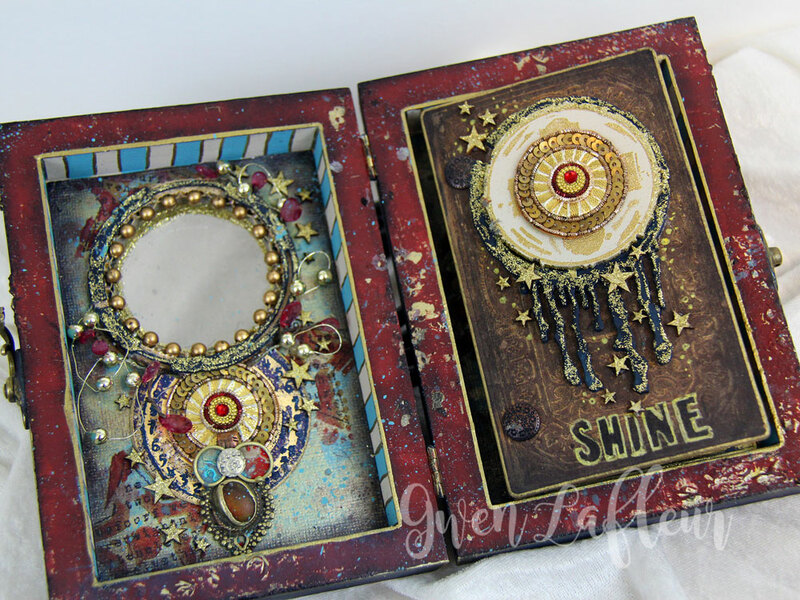 Set in a shadowbox about 8" x 12" x 1-1/2", features collage, paint, heat embossing, fabric, wood, and semi-precious gemstones. $345.95 - email if interested. 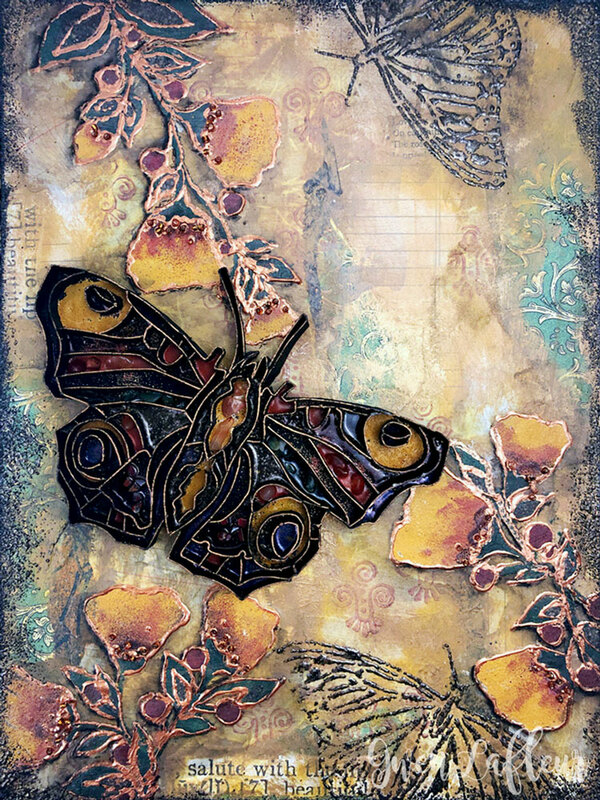 "Memories of Times Past" mixed media artwork. 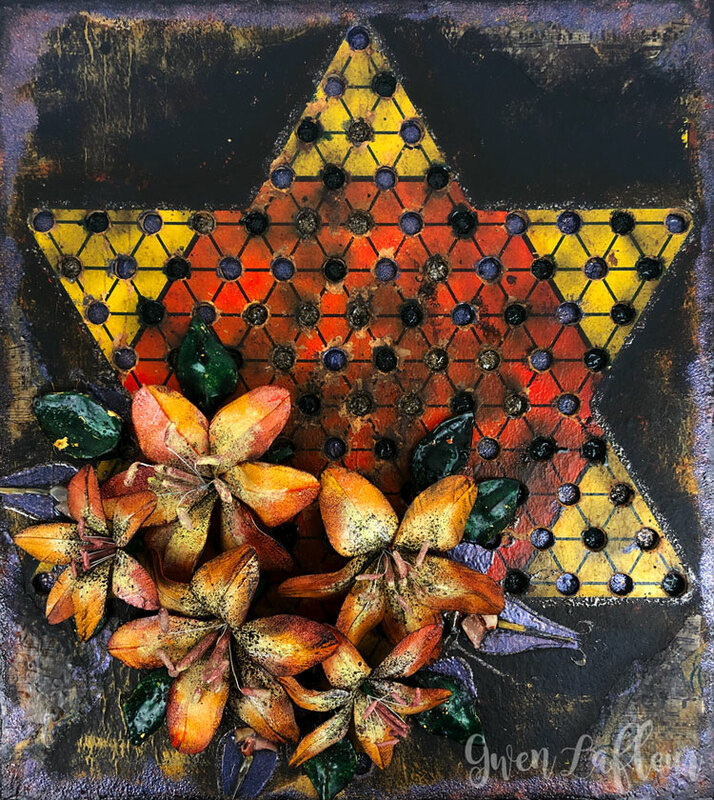 The base is a vintage Chinese Checkers gameboard that's been painted, collaged, and embossed. 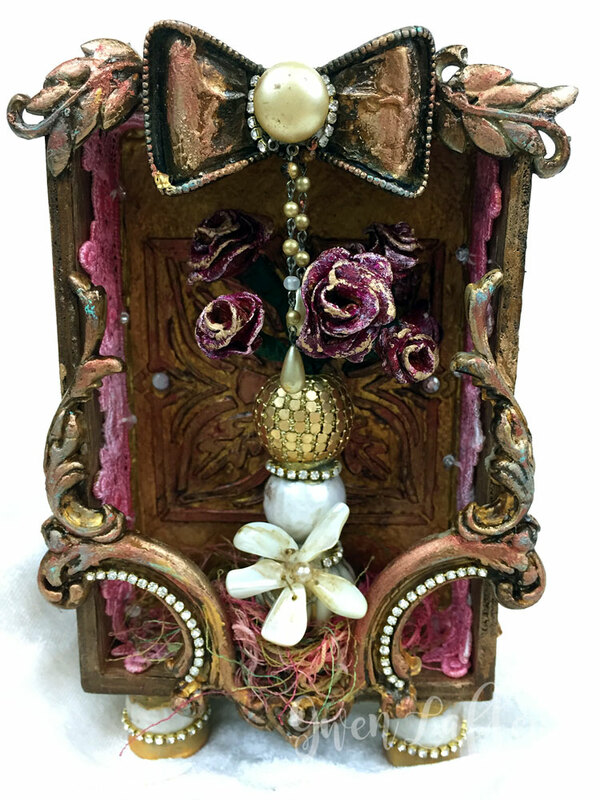 The flowers are dimensional, handmade with embossing powder skins, paint, wire, and clay. $474.95 - email if interested. 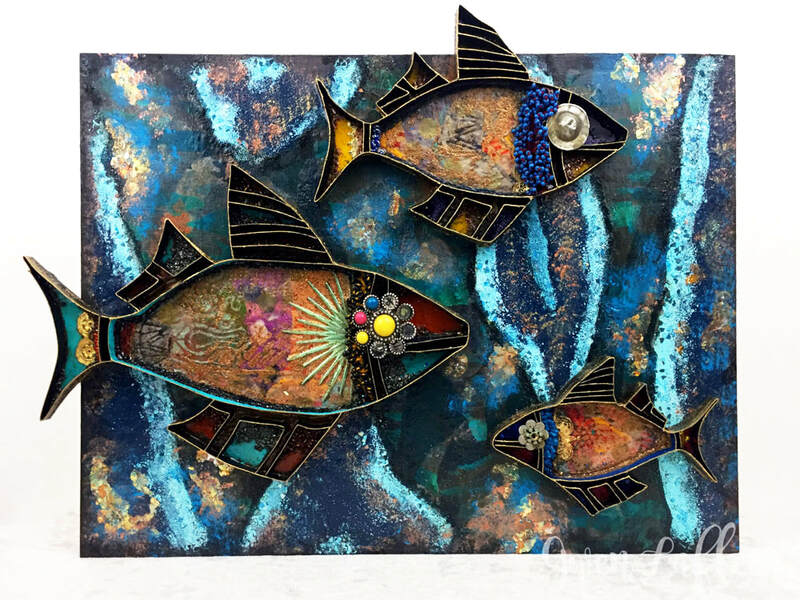 "Swimming Upstream" mixed media artwork in a wooden ladder frame. 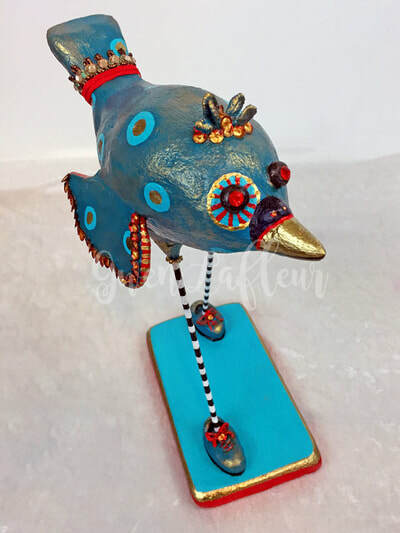 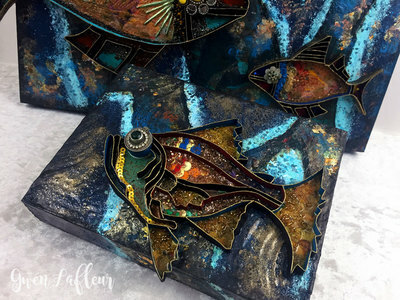 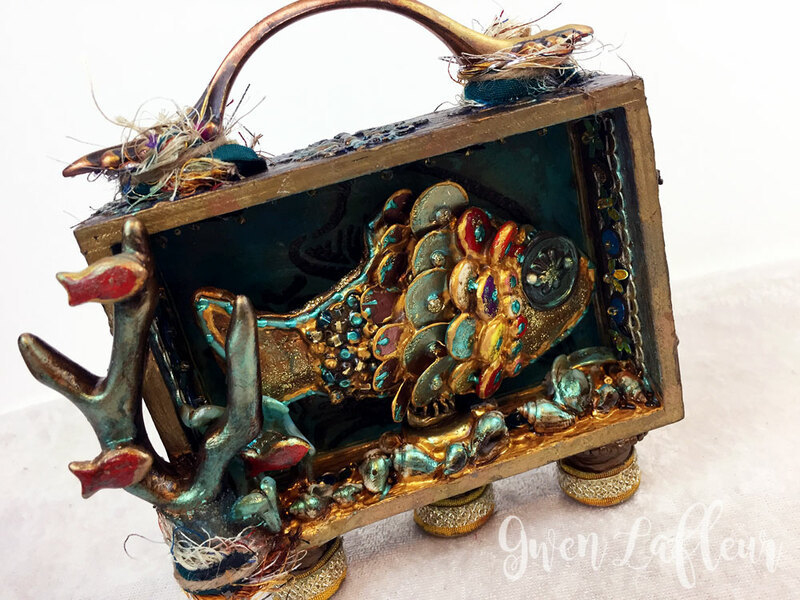 Approximately 24" x 10" x 1/2" with handmade basswood fish embellished with embossing powder, paint, and semi-precious gems. 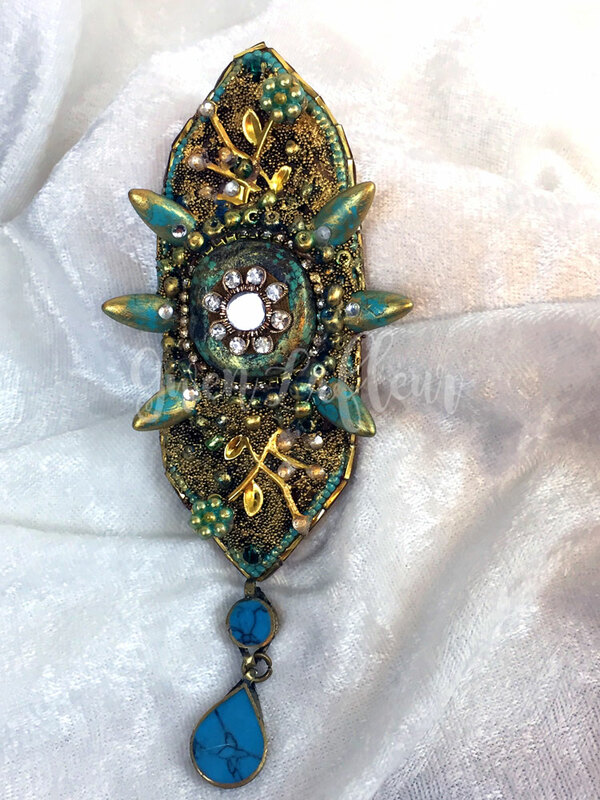 $424.95 - email if interested. "Butterfly Kisses" mixed media artwork on a 9" x 12" x 1/4" wood panel. 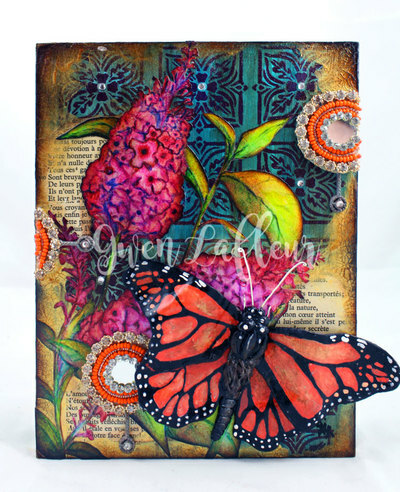 Heat embossing, collage, stenciling, and paint with a dimensional 3D collaged butterfly and hand-drawn flowers. 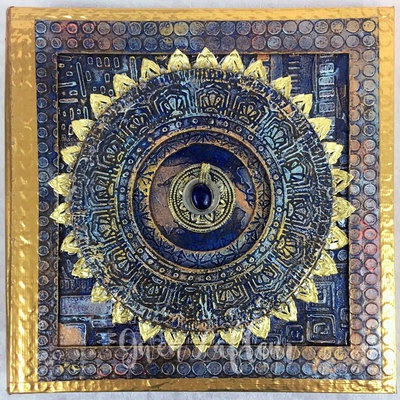 $295 - email if interested. 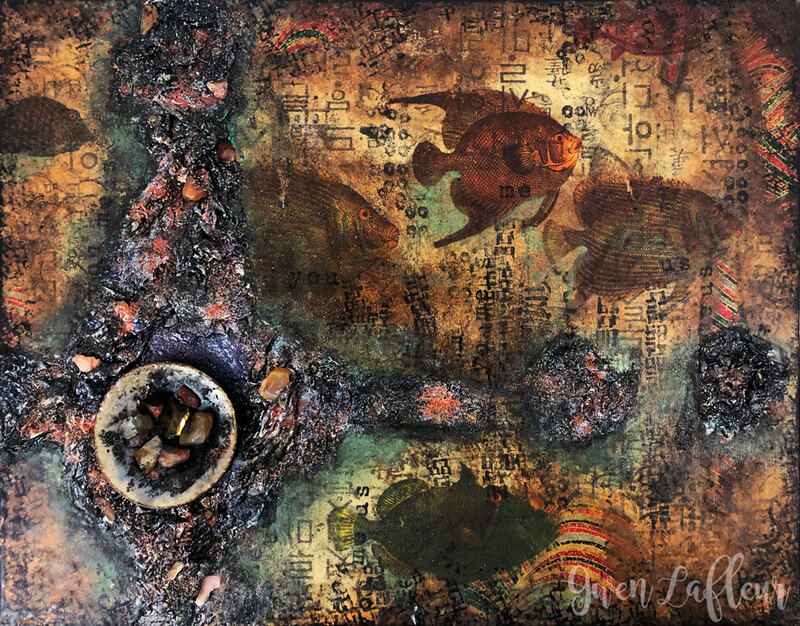 "Primordial" mixed media artwork on canvas. 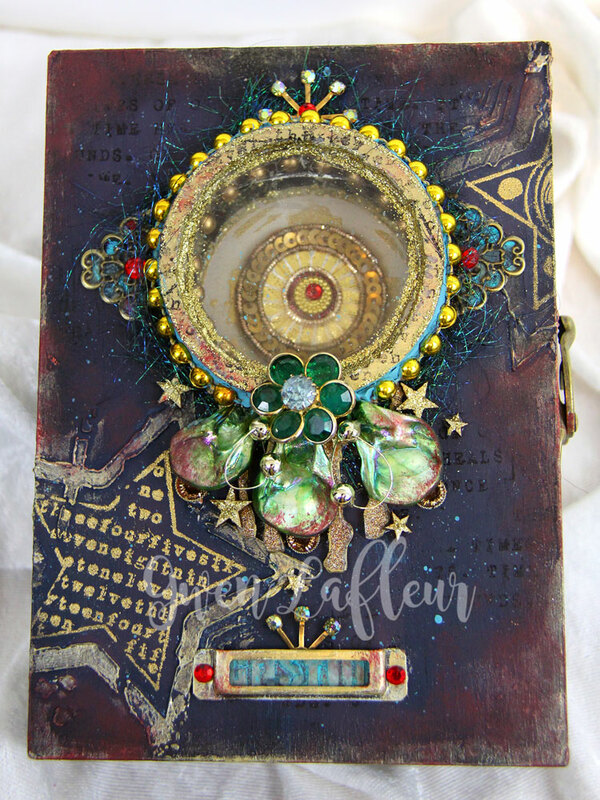 11" x 14" x 1/2" with collage, paint, heat embossing, and semi-precious gemstones embedded in the textural collage. $245 - email if interested. 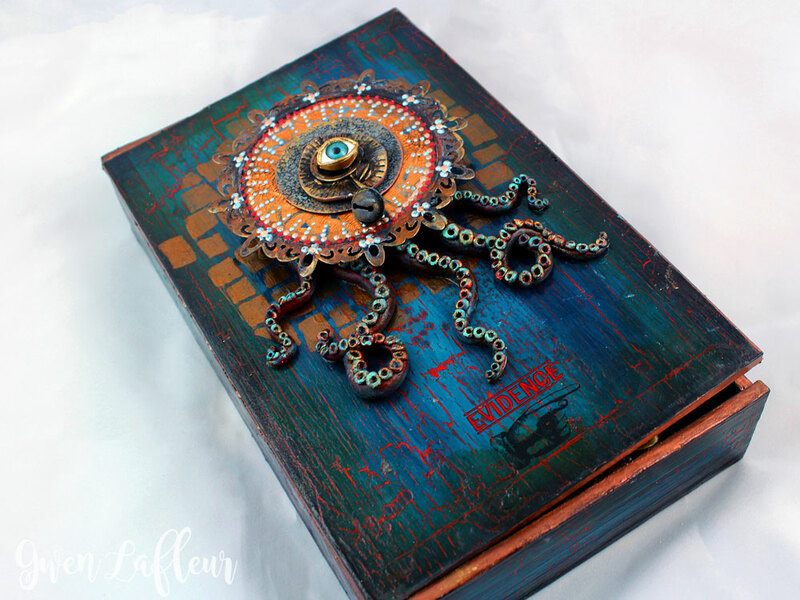 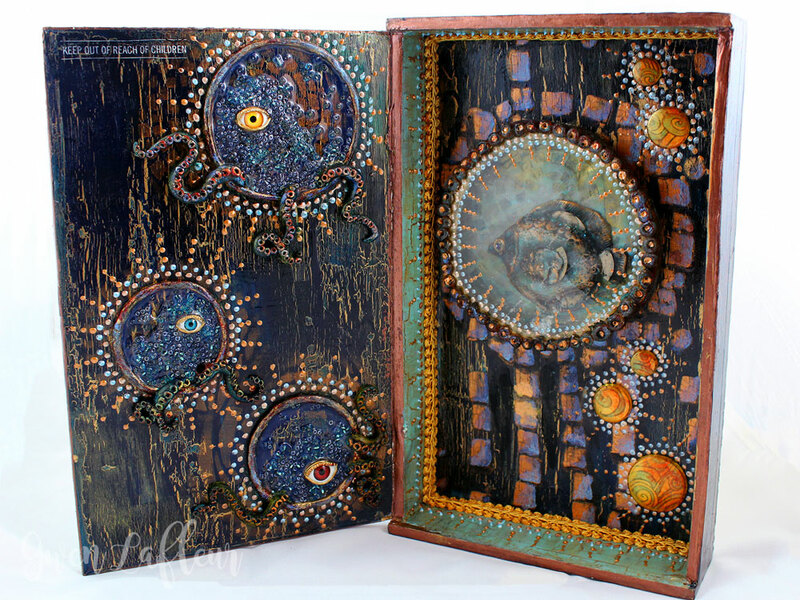 "Into the Deep" mixed media shadowbox by Gwen Lafleur. 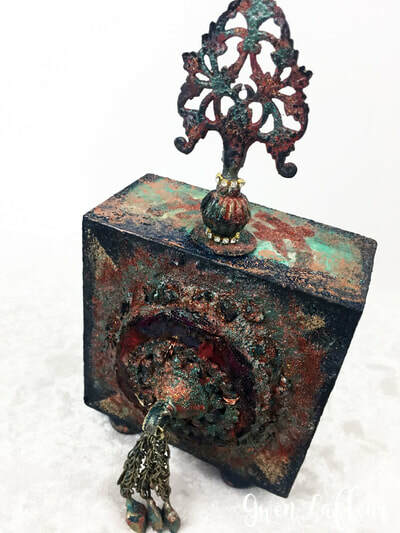 Box is 8" x 8" x 1-1/2" and incorporates acetate, acrylic paints and mediums, found objects, beads, embossing powder, stencils, and fabric. 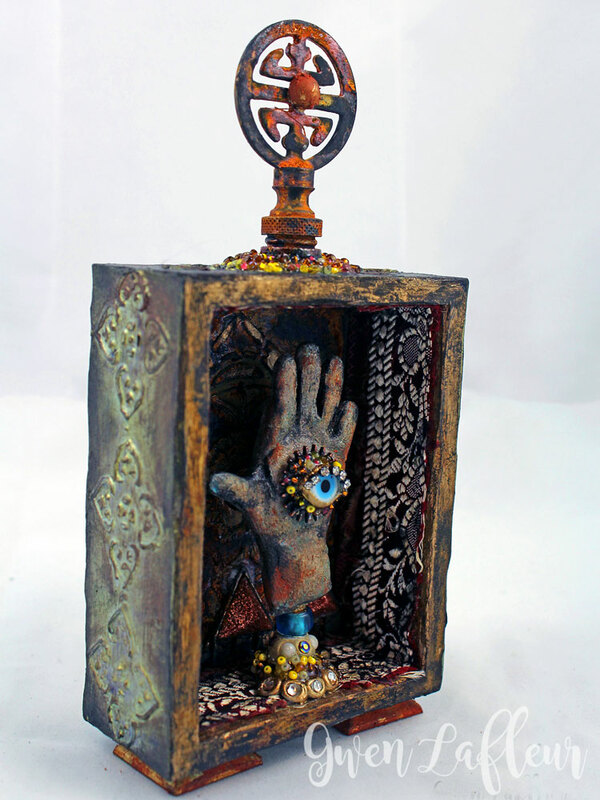 "Tribal Memories" found object assemblage / mixed media artwork by Gwen Lafleur. 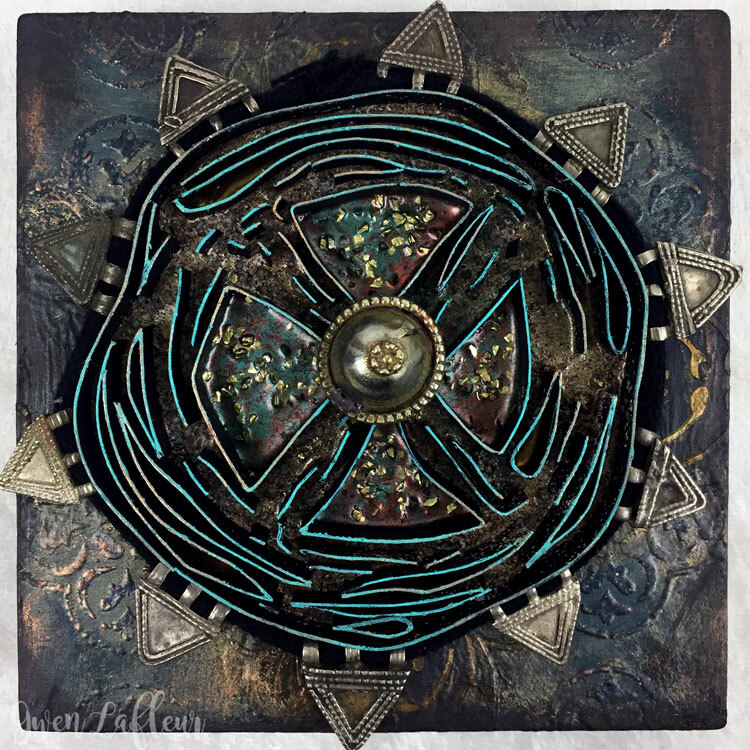 Base is a 4" x 4" x 2" cradled birch panel. 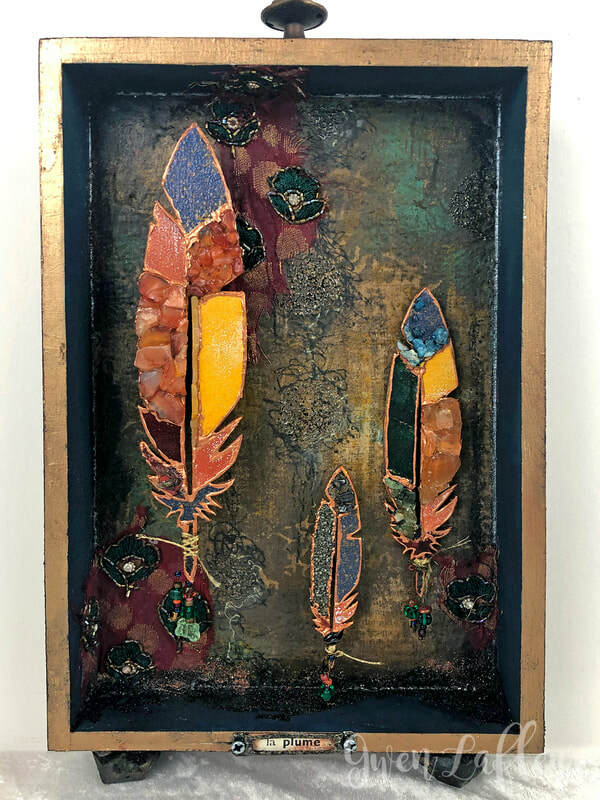 "Rite of Passage" dimensional mixed media artwork by Gwen Lafleur. 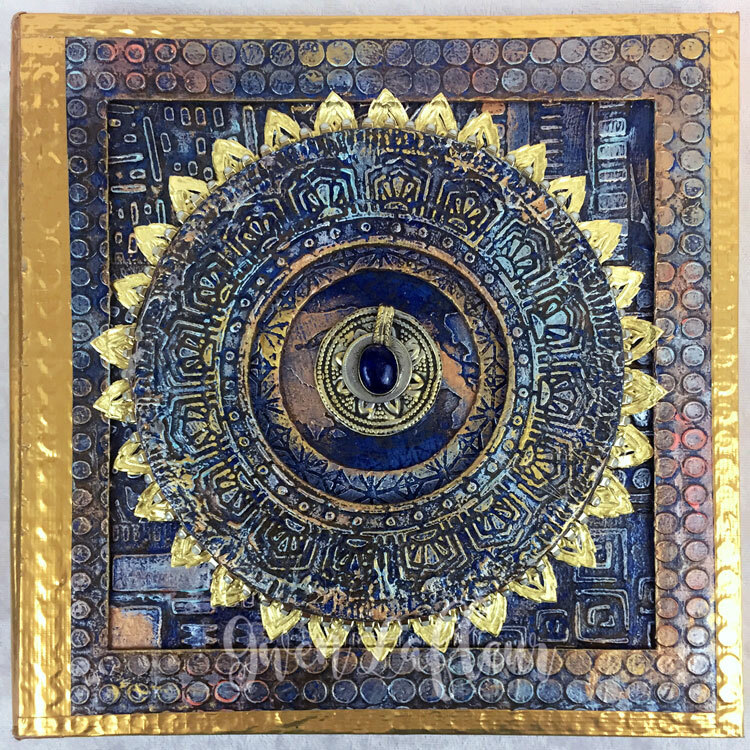 5" x 5" x 1-1/2" on cradled birch panel. 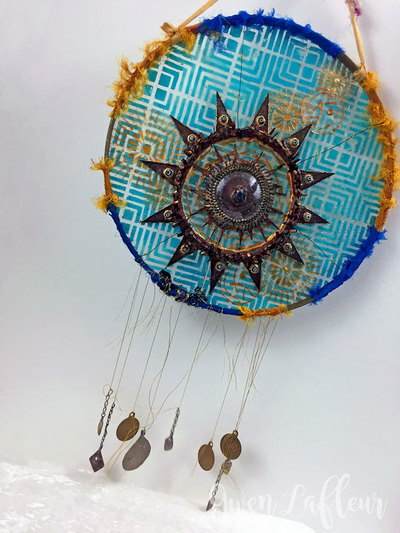 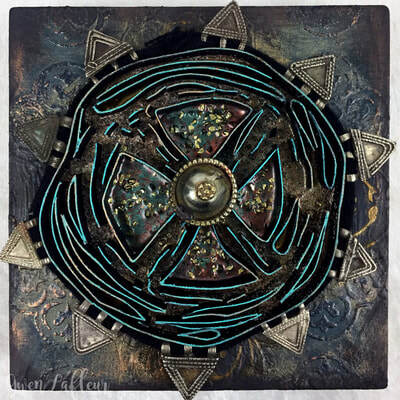 "Boho Dreamcatcher" hanging mixed media artwork by Gwen Lafleur. 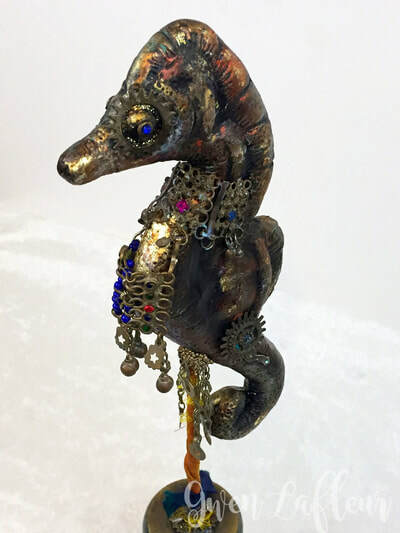 "Steampunk Seahorse" mixed media and assemblage sculpture by Gwen Lafleur. 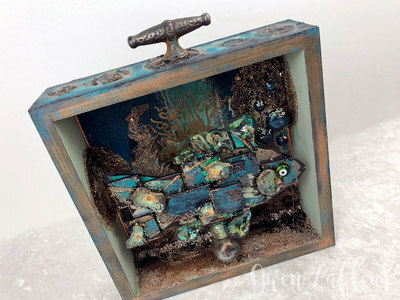 "Seascape" mixed media shadow box by Gwen Lafleur. 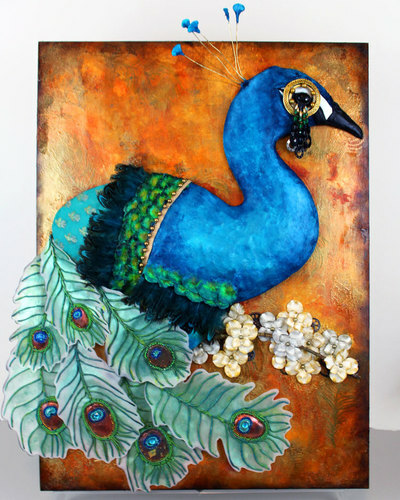 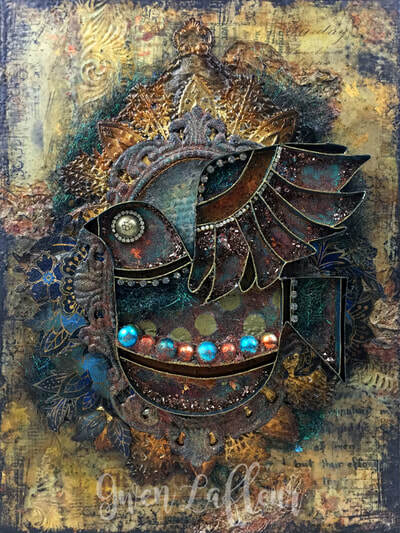 "Boho Peacock" dimensional mixed media artwork by Gwen Lafleur. 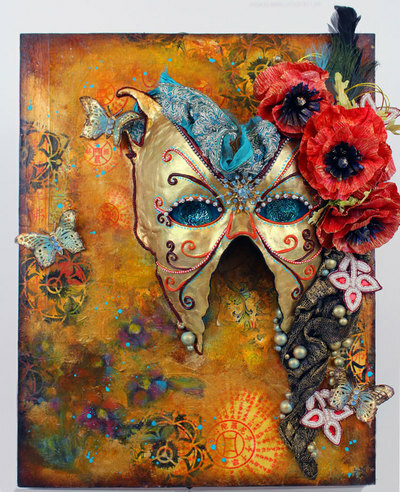 18" x 24" x 1" on cradled birch panel.